What is soft surgery treatment? Soft surgery treatment is a non-invasive bloodless, reliable, easy to implement and safe procedure. Due to this innovative technique it is now possible to obtain the same results as you would with traditional surgery, without the need of anaesthesia, without scarring and without unnecessary risks. How does the Plexr work? This innovative technology utilises plasma - formed through ionisation of atmosphere gasses – to stimulate instant contraction and tightening of skin fibres. This technology does not use scalpel or laser to remove excess skin. This procedure avoids many of the risks associated with traditional intervention, providing a quick and easy recovery. The treatment is preformed without cutting or need of stitches. All prospective patients are advised to have a face-to-face consultation with our doctor before making an appointment to undergo this procedure. During the consultation we will analyse your tissues and explain the range of treatment options available. How is the Plexr treatment preformed? The treatment is performed through dots made with the Plexr device at 500 microns apart to stimulate instant contraction and tightening of the skin fibres. Each of these dots sublimates (which means to change a substance from a solid into a gas) the superficial skin cells without affecting an important deeper layer known as the basal lamina, without causing bleeding and more importantly without damaging surrounding tissue. a standard session lasts 20 – 30 minutes depending on the area(s). Patients are required to attend the appointment 30 minutes prior to the actual treatment to have topical numbing cream applied to the area to be treated to minimise the risk of discomfort during the procedure. Immediately after the treatment the treated area(s) will be quite red and mildly swollen. Patients may experience some swelling and mild discomfort in the treated area following their treatment and this may last up to 3 days. At the site of each dot of treatment a carbon crust immediately forms. These crusts should not be touched for 5-7 days except to camouflage them with oxygenating post-procedure foundation. We recommend oxygenetix for this purpose. How do I maximise the effects of Plexr treatment? At the site of each dot of treatment carbon crust immediately forms. These crusts should not be touched for 7 days except to camouflage them with oxygenating post-procedure foundation. We recommend oxygenetix for this purpose. Avoid applying moisturising creams until the carbon crusts have fallen off, usually after 5-7 days. Be extra cautious not to rub off the carbon crust for the first 5-7 days. Avoid all direct sources of heat i.e. sun, UV radiation and saunas for 4 weeks. Immediately after the treatment the treated area(s) will be quite red and mildly swollen. Any scabs will fall off after 3-5 days and carbon crusts fall off after 5-7 days. These can be camouflaged with specially designed post-procedure foundation. Unusual side effects include infection, scarring and temporary changes in skin pigmentation. The likelihood of these side-effects is minimised by adherence to the aftercare advice given when the treatment is performed. What can I expect to see after my first treatment and how long will it taje for me to start noticing the effects? Most people see noticeable results after the first treatment, although this gradually improves over the course of the following 2-4 weeks. Some patients may require more than one treatment and this is subject to your personal expectation. The number of treatments will vary according to the desired degree of correction and individual’s physiological response to the treatment. After the results gained in the following 2-4 weeks, some patients may require further treatment to achieve optimal results which should be carried out at 6-8 weekly intervals. Plexr is very safe with full European CE approval. About 3200 Plexr devices have been sold worldwide. Only doctors who have received specialized training are authorized to perform treatments with the Plexr. Is Plexr treatment right for me? 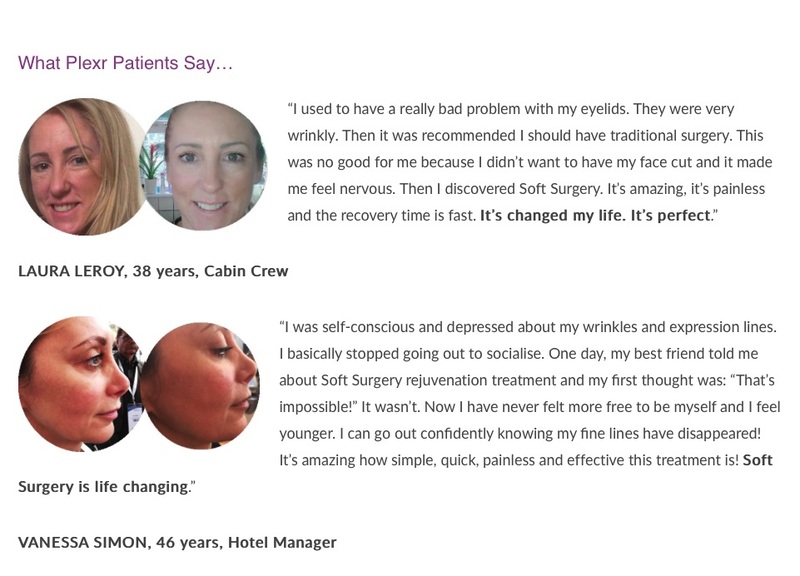 If you suffer from loose skin in your upper/lower eyelids that gives you a “tired” look and you are seeking a non-surgical solution to tighten your skin, then the Plexr could be your answer. Furthermore, Plexr can be used for face and body lifting, acne treatment, scar correction, tattoo removal, belly button stretch marks, removal of benign skin growths and lesions, etc.